Our last chapter was a bit theoretical on the inevitability of culture shock and how to overcome it. This chapter is more nuts and bolts about how to interact with various people on the mission field in the developing world. This chapter is sprawling, so our discussion will have to be limited to the highlights. There are a number of statements here that really could warrant their own books, and occupy much fruitful discussion between the missionaries in Karamoja. Interaction with the rich and powerful is the first concern of the chapter. The author talks primarily about government workers at the national level and heads of state, but this could be extended to anyone who has more cultural influence than we do as missionaries. As Westerners going into a developing country, we have considerably more means at our disposal—both knowledge, influence, and funds—than many of the people we work with. This gives us a de facto position of influence in the majority of our interactions. However, we interact with people from time to time that, due to their position in national power structures, outrank us. These might be the president of Uganda or the paper shuffler at the immigration office or the well-respected Karimojong village elder. All of these people have the cultural means at their disposal to assist or hinder our work and presence in Uganda. Thus, we are wise to be careful in our relationships with them. The first and obvious area to consider is our adherence to governmental policies. In some countries, missionaries encounter governments who are openly hostile to the Gospel and hold to policies that clearly violate human rights. In such instances, it is our propensity to want to speak out or become involved politically, and while there may be a place for this, it is not always a wise course. We want it always to be clear that we are not working in another country to promote American culture or Western political ideals. We are working for the spread of the Christian faith, and our political involvement can muddle this message to those with whom we work. Additionally, political antagonism may result in deportation for the missionary, but the consequences for the national church may be much more dramatic. We do not want to be responsible for bringing unnecessary persecution to a nascent church. We are fortunate in Uganda to have the ability to openly proclaim the Gospel. We are unfettered even to the extent of being welcomed into the local schools to teach from the Bible. Local government officials are even attenders at our church in Nakaale. The other temptation, of course, is to try to curry favor with these officials. Periodically, we need them to assist us in getting permits or filing paperwork, and thus we are predisposed to giving them assistance at a level that we might be unwilling to give to other neighbors. This is an issue in the church that James discusses. But the rules may be different in civic life, and indeed Ugandan culture requires that socalled “big men” must be afforded a greater degree of respect. As Americans, we ourselves are also considered “big men” and are treated with greater deference than many in our area. On some level, it’s appropriate for us to accept our role (and the attendant responsibilities such as the generous giving of gifts) in order to conform to cultural expectations, being careful to be clear in our insistence that all people are equal within the walls of the church. Perhaps the thorniest area that Hale discusses in this chapter is on the paying of bribes. Such small payments are customary in Uganda, and as Hale points out, bear great resemblance to tips for service. Tips are a way to guarantee good service next time, bribes are a way to guarantee service this time. Chloe and I were standing in line at a bank in Mbale, trying to make payment for our driving permits. We waited and waited and one man came in to withdraw money. He cut right in front of us, was helped immediately, and gave the teller one of the bills from his withdrawl with a smile on his face. This is quite customary. On the other hand, I was pulled over by a traffic cop in Kampala for an illegal U-turn (I was lost and confused about the signage and, unfortunately, white). He threatened me with a ticket, and when I asked him to forgive my offense, he asked that I at least give him something for his lunch. These are complicated situations that the missionaries in Karamoja come to different conclusions on. Hale suggests—wisely, I think—that we not hold to too many hard and fast rules in these matters. In Uganda, most of these transactions are not considered bribes, they are called “showing appreciation.” Hale writes that the term “bribes” should be considered exclusively when some form of extortion is clearly taking place. These matters, he says, are far from black and white. The following sections of the chapter deal primarily with our interactions with people who have less cultural capital than we. These are other locals who have less wealth, connections, and mobility than we do. Three situations he mentions in particular are the hiring of workers, interacting with shopkeepers, and dealing with requests for assistance. Again, the rules here are often different from our typical American sensibilities. While many Americans balk at having servants, they are very common in the developing world, and in fact can be a great benefit to our work as missionaries. In our case, Chloe and I are both in Karamoja working with roles assigned by the mission, but the daily tasks of housekeeping can take much longer there than they would in America. We don’t have washing machines or Swiffer mops or ready-to-eat meals. Thus, hiring someone to do these tasks for us allows us much greater freedom to accomplish the work we are there to do as well as providing employment to people in need. It is a common expectation in our area that those with more means will offer help to those with less, and the hiring of household help allows us to fulfill this expectation in an equitable way as long as we try our best not to pay an inflated wage, which can end up distorting wages for everyone. Hale’s second scenario involves buying goods and interacting with the seller. We don’t have coupons or advertised specials in Uganda, and the way that you save money on your shopping is by skillful bargaining. Depending on your outlook, bargaining can be an enjoyably interactive experience, or it can make you miserable. In this regard, it is helpful for us to be circumspect and remember that our whiteness is an assurance that we will certainly be charged more than an African would. This is not considered unjust. Again, it is the expectation that those who have more should pay more. Even our African (but non-Karimojong) clinic staff pay a bit more at the market in Karamoja because they are known to be outsiders with well-paying jobs. It’s also helpful to remember that most staple foods still cost pennies on the dollar compared to what we would pay in San Diego. The final interaction that Hale comments on is the giving of financial assistance. Pleas for such are a regular occurrence for those on the mission. Our general policy is not to give gifts, though even this rule has a number of exceptions. Our program allows us to offer work to the majority of those who come asking for money. We are happy to employ anyone able and willing to work, and employment offers an honest means of provision that doesn’t do as much to foster dependence. The giving of loans is a process that requires us to be a bit more judicious. Hale writes and we agree in practice that it is most often wise not to give any loans except to people who work for the mission (whose wages we can garnish if need be), but this still requires much wisdom. A loan to one person can create a cycle of dependency, but for another it can be the catalyst for personal advancement. We are always in need of prayer in these difficult matters. Hale’s final section discusses the unique circumstances attending to our interactions with local Christians. The primary issue he deals with is church leadership—how should the position and knowledge of the missionary play out in local church governance? Much of what he has to say regards ministries that are working alongside established churches. He stresses that local Christians, having the best knowledge of local custom and a greater understanding of larger national issues like politics, ought to be allowed great leeway to make ministerial decisions. He cites the example of Nepalese Christians who often are forced to wait over a year before being baptized. While this may scandalize us, he explains that there was great fear of government spies within the church. Additionally, they held new converts to a higher standard of morality and teaching than most Westerners would because of the fear of the new convert falling away and bringing disgrace to the church. 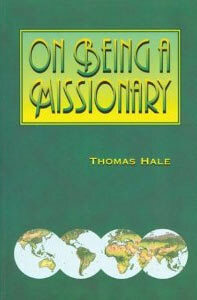 Hale suggests that, when possible, missionaries should take a backseat in the local church’s deliberations, offering advice when it is asked for or otherwise gently guiding the discussion with biblical evidence. In this way, a missionary can offer up his or her (usually) deeper knowledge of the Scriptures and Christian tradition while not directing the discussion with little knowledge of the local context for application. Finally, Hale discusses the ever-controversial issue of the employment of church members and the distinction between the work of the church and the work of the mission. This is an area of constant difficulty for us in Karamoja. We desperately want to avoid expressions of faith based on the desire for employment, but in a culture where lying and stealing are not necessarily looked down upon, church members obviously make a more (if only moderately) likely pool of honest candidates. We don’t want to make the confession of Christ a guarantee of future employment, but in our quest for genuine faith, we don’t want to discriminate in the other direction, thereby discouraging people from coming to Christ. Truly, we struggle to draw a clear distinction between the practical work of the mission and the presence of the Church in Karamoja. As a mission, we are happy to hire people to do necessary jobs, but as members of the congregation in Nakaale, we are eager for individuals to volunteer of their time and resources to be on our diaconal committee, to lead in singing, or to teach Sunday school. These distinctions are easily muddied and keeping them clear is a difficult task. Please remember us as you pray for these and for all of our interactions in Uganda. We never know which will be used of God in a fructifying manner. This summary is necessarily bare-boned. Any longer and it risks becoming a New York Times article. As I said, we’ve had many fruitful discussions on the mission about these matters, and for those interested, I’m happy to continue these. Some good old-fashioned dialectic cannot be anything but fruitful as we seek to be faithful to biblical teaching and effective in our ministries in Karamoja. Usually, a chair is without a bicycle.